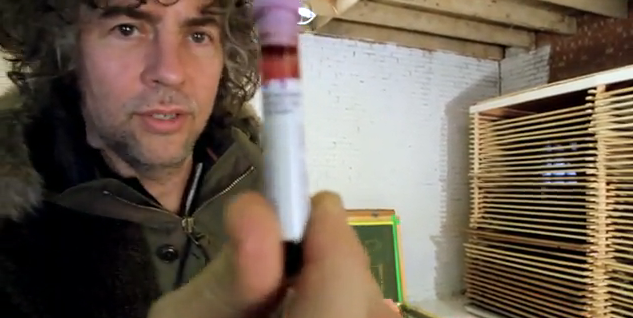 So, both Pitchfork and Crawdaddy have mentioned this video of Wayne Coyne printing a Flaming Lips poster with his own blood. It’s not as ghastly as it sounds, just a little gross. But, it’s interesting to watch Coyne basically create a collector’s item, knowing very well that his fanbase will gladly shell out their homes, limbs or offspring for something this unique. Not to mention, seeing as the poster is laced in Coyne’s coagulated red fluids, I’m sure owning the poster will be like owning a piece of their hero.